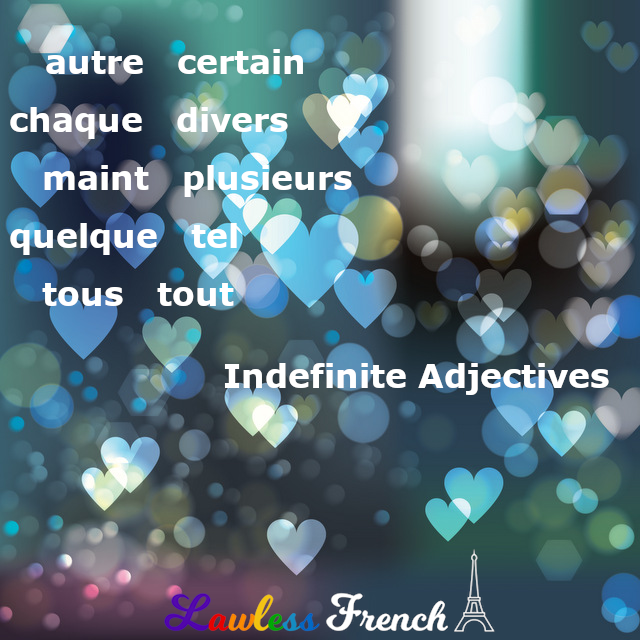 Indefinite adjectives describe nouns in a general or non-specific way. Many indefinite adjectives indicate a vague quantity. Quelques élèves sont en retard. Some students are late. J’aime toutes vos idées. I like all of your ideas. + Autre and quelque have two forms: they must agree with the noun in number. Il veut une autre voiture. He wants another car. J’ai deux autres questions. I have two other questions. Il faut attendre quelque temps. You have to wait some time. Voici quelques chaises. Here are some chairs. When autres is used without a number, you need the indefinite article des. However, it changes to de (see the end of that lesson) and then contracts, so you end up with d’autre(s). Y a-t-il d’autres idées ? Are there any other ideas? + Certain, maint, tel, and tout each have four forms: they must agree in gender and number. Elle a un certain charme. She has a certain charm. Une telle situation est inattendue. Such a situation is unexpected. Je le fais tous les jours. I do it every day. + Chaque is invariable. It can only be singular and is used with the third person singular (il) form of the verb. Chaque enfant peut choisir un livre. Each child can choose one book. + Divers and plusieurs can only be plural and are used with the third person plural (ils) form of the verb. Plusieurs is invariable, while divers can be masculine or feminine. Diverses personnes sont parties tôt. Various / Several people left early. J’ai posé plusieurs questions. I asked several questions.